The Hermitage tours are essential part of your cultural stay in St. Petersburg. Previously, Catherine the Great, the founder of the collection, exclaimed: “Only mice and me can admire all these beauties!”. Later on her forward-thinking grandson Emperor Nicolas I opened up the Imperial Hermitage as a museum. It was back in 1852. From that time to 1917 not only mice, but also privileged categories of people were welcomed to the Hermitage Museum. The Revolution of 1917 turned the whole imperial complex consisting of 5 (!) buildings into opened space for everyone and nowadays visitors from different countries come to Russia to see one of the best museums of the world! Dreamed to visit the Winter Palace? During excursion of the State Hermitage the guide will definitely take you to the Winter Palace, where the Romanovs lived in winter time. Lucky them! They could afford the official residences for summer time as well – but that’s a different story.This Winter Palace however didn’t witness the founder of our city Tsar Peter the Great: he lived in a different much smaller one, called the same – Winter Palace. We are opening a secret now: there were several “Winter Palaces” in history. The first owners of the world-famous Winter Palace you are going to visit were Emperor Peter III and his wife, future Empress Catherine the Great. The Winter Palace appeared too spacious and cold for this lady. So her Highness Empress Catherine commissioned another smaller palace to be created next to the official Winter Palace where ambassadors and high-status guests were received at receptions and on balls. The name of that smaller palace next to the Winter Palace was quite modest: Hermitage. In French they don’t pronounce the first letter of this word – and neither do Russians. “Ermi’tazh” (with a typical French emphasis on the 2d syllable) consists of two pavilions and two galleries connecting them. The pavilions housed cosy rooms for private quarters of Catherine the Great and her favourite Count Orlov. It was typical for the 18th century to have separate female and male quarters despite their sexual revolution and impressive amount of lovers, softly called “favourites”. Please, wait a moment! I beg your pardon, my reader, I forgot to answer the question you are curious about! The name! What does it mean? Hermitage is “hermit’s dwelling”, the place where one can be alone. So, in her refuge place, away from the hectic life of the court there lived Empress Catherine. Now the mystery is resolved and we find ourselves in the second building of the world-known complex, which gave the name to the entire museum. Interesting, but why this particular “refuge place” played such an important role? Empress Catherine in her Hermitage quarters found a special place for art as well. In the two galleries between the pavilions (where she and Orlov lived) Catherine the Great displayed her first collection of paintings she purchased in Europe. This collection got the name of the building and then grew so large that now it comprises nearly 3 million exhibits! The name of one of the largest museums of the world might sound a little ironic today – it’s one of the most crowded places, especially in summer, when it’s complicated even to get into the Hermitage unless you are on a private guided tour. Nevertheless the name Hermitage is perfect. It reminds about the private purpose of the first collection and invites you on your own personal dialogue with art. By the way, on a tour of the Hermitage one should be prepared to see mainly Western-European art – one of the main interests of the royal collectors. Nowadays the Hermitage palace, where Catherine the Great lived her private life, is called Small Hermitage, not to confuse it with three other buildings that bear the same word in their names. For her growing collection Empress Catherine ordered another building, nowadays called Old Hermitage. Old in comparison with what? In the 19th c. they didn’t stop buying art and needed more space. Thus, another building was erected – this time for the museum purposes. That happened at that time of Nicolas I, the tsar mentioned above. As a result 18-century art gallery of Catherine the Great was called Old Hermitage, while the imperial museum founded by her grandson – New Hermitage. 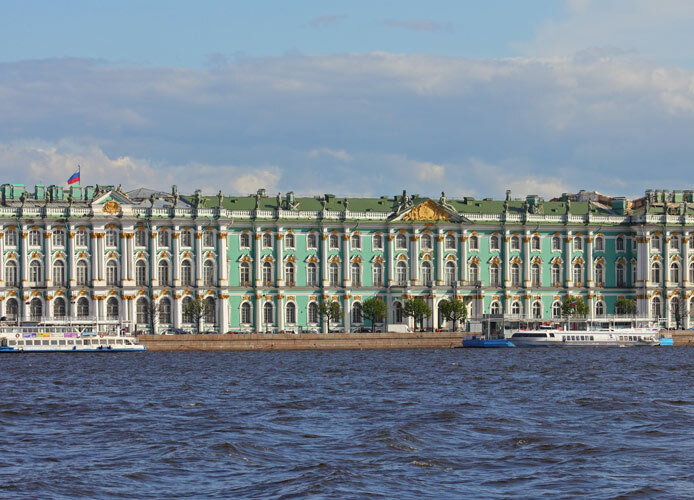 These four interlinked buildings including the Winter Palace are the ones you are going to explore on your Hermitage tour with our informative and entertaining guide. Who wants to see the collection of 3 million exhibits and die? Nobody! And we know how to show you around the Hermitage in the best way. The fifth building of the complex is called the Hermitage Theatre and is closed for regular excursions, as nearly every evening it opens its doors for delighted guests of St. Petersburg and its locals. Watching a ballet or listening to an opera in the Hermitage Theatre will definitely add to your St. Petersburg discovery as you will immerse yourself in the atmosphere of Catherine the Great’s time and enjoy being a guest in her small, but cosy and elegant theatre. Welcome on the Hermitage tour with your personal guide!